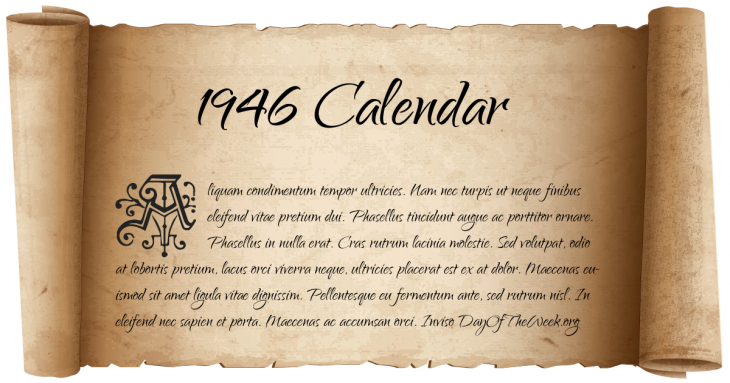 February 2, 1946 – New Year’s Day in Chinese calendar. Start of the year of the Fire Dog in Chinese astrology. March 18, 1946 – Diplomatic relations between Switzerland and the Soviet Union are established. May 9, 1946 – King Victor Emmanuel III of Italy abdicates and is succeeded by Humbert II. May 25, 1946 – The parliament of Transjordan makes Abdullah I of Jordan their Emir. June 2, 1946 – Birth of the Italian Republic: In a referendum, Italians vote to turn Italy from a monarchy into a Republic. After the referendum the king of Italy Umberto II di Savoia is exiled. July 10, 1946 – Hungarian hyperinflation sets a record with inflation of 348.46 percent per day, or prices doubling every eleven hours. August 16, 1946 – Mass riots in Kolkata begin, in which more than 4,000 would be killed in 72 hours. October 23, 1946 – The United Nations General Assembly convenes for the first time, at an auditorium in Flushing, Queens, New York City. December 15, 1946 – US-backed Iranian troops evict the leadership of the breakaway Republic of Mahabad, putting an end to the Iran crisis of 1946. December 31, 1946 – President Harry S. Truman officially proclaims the end of hostilities in World War II. Who Were Born On 1946?